Cedar Glen #971 is a single story cabin located in the lower Moonridge area which comes with a great fenced back yard that includes a charcoal BBQ and private outdoor spa for your use. 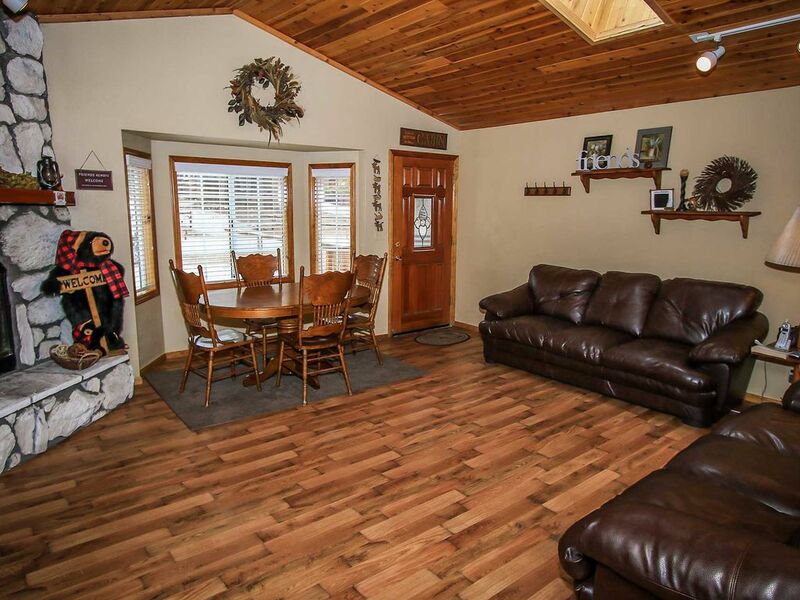 The nicely decorated living room has comfy couches, a gas log fireplace, and a TV/DVD and boombox stereo. There is an equipped kitchen with cookware and utensils, appliances and a dishwasher, plus a dining table and washer and dryer are available. This home is in a great location, with efficient amenities, making it the perfect place for your next Big Bear vacation! Pots and pans were disgusting so plan on eating out. Jacuzzi only gets to 88 degrees so don't bother bringing your bathing suit. And if you're cold in the unit plan on turning up the heater because you won't find a lighter to light the fire place. Thank you for sharing your voice. We appreciate the feedback and have shared it with the Team. You are important! We hope you do come for another visit soon so that we can show you a much better experience! Place was nice, a block from some good hiking. Clean and definently wknd ready when we arrived. Overall it was a great place for what we were looking for there. Yes! This is the experience we truly strive for. We hope you made some wonderful memories in Big Bear and that you return many times. Your feedback has been shared with the Team. We are looking forward to helping you plan your next visit. Booked this last minute for a ski trip. Was little worried because it was available on busy week and there were no reviews from previous renters. We were pleasantly surprised. Clean cabin and 2 full baths was convenient for our family of 4 (easily accommodates 5). Couple of negatives: 1) no wifi and no cell service for at&t in the cabin or even in the neighborhood, 2) pots / pans and cooking utensils were pretty beat up (if you plan on cooking a lot, bring your own). Otherwise, nice place and we would stay there again. Our Mission is to create the ultimate Big Bear vacation experience, making memories that will last a life-time by providing outstanding Guest Service and ensuring properties are clean and functional for our Guests. It sounds like you had a great experience in Big Bear, the Cabin, and with our Staff. This is the excellence we strive for. I have forwarded the info on the cookware to the Team/Owner so they can address that. Take Care and See You Soon!